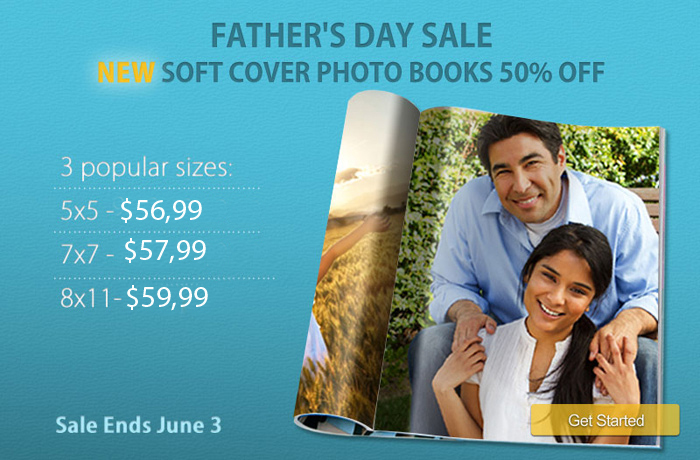 a soft cover photo book for 50% off! With the long weekend ahead, why not create a soft cover photo book for your husband or father to show him how much he means to you? You’re sure to love these soft cover books! They are both beautiful and affordable, and are perfect for sharing the joy of fatherhood through your own photos and words. The books are printed on high quality paper stock and are stock and available in 3 popular sizes: 5×5, 7×7, and 8x 11. But, these amazing prices are only available for the next week, so make a request today and I will create and order yours ! – sale starts today and lasts through June 3, 2011. Order by June 3rd to ensure delivery by Father’s Day. To order your soft cover photo book send an email to greisphoto@gmail.com and I will contact you back with details. Thanks for visiting. Sale ends jun 3rd….ready Go!